Mary Skinker, Carson's teacher and mentor pictured with Sophomore Class Officers. A photograph of the Chemistry Lab in Louise C. Buhl Hall of Science taken around the time of Rachel Carson's time at the College. Rachel Carson and the Honorary Hockey Team in a 1928 yearbook photograph. 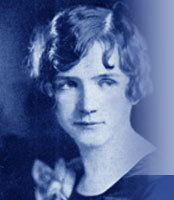 Rachel Carson was a member of the Omega Club, a literary club on campus. Below are links to a variety of online resources with more information about Rachel Carson. The collection contains manuscripts, notebooks, letters, newspaper clippings, photos, and printed material relating to the life and career of Rachel Carson. The Library's Digital Collections contains digital versions of the collection including photographs, drawings, and correspondence. The Lear/Carson Collection contains the manuscripts Linda Lear collected in the course of researching and writing the biography, Rachel Carson: Witness for Nature and the manuscripts used for her anthology of Carson's writings, Lost Woods: The Discovered Writing of Rachel Carson. Contains the the manuscript of Sea and Earth: The Life of Rachel Carson, Carson family background material, interviews with friends and relatives of Rachel Carson, photographs of Carson, newspaper clippings, and research notes. Founded in 1989, this institute at Chatham University promotes awarenes and understanding of environmental issues through educational programs, conferences, lecture series, and seminars. The website, devoted to the life and legacy of Rachel Carson is an excellent source for information including a biography, lists of publications, and links to resources. The birthplace and childhood home of ecologist Rachel Carson preserves and restores this historic site and offers education programs which advance Rachel Carson's environmental ethic. A clearinghouse and library with information on pesticide-related issues, Rachel Carson Council provides answers to the public, produces various publications clarifying pesticide dangers, brings alternative pest controls to the public's attention, and presents conferences and workshops for the public and the scientific community. An article written by Peter Matthiessen from this special issue of the magazine, includes a brief recording of Rachel Carson speaking and links to other resources. Essay by Linda Lear, author of Rachel Carson: Witness for Nature written for the series "Wilderness and American Identity" on the National Humanitites Center website. An article by Frank Graham, Jr. published in the EPA Journal. Rachel Carson's obituary from The New York Times. An essay from the Online Ethics Center for Engineering and Science about the publication and effects of Silent Spring. Article from the National Resources Defense Fund website. Dorothy McLaughlin's essay for PBS's Frontline website. Michael Lipske's article from National Wildlife magazine discusses Silent Spring's effect on the environment.